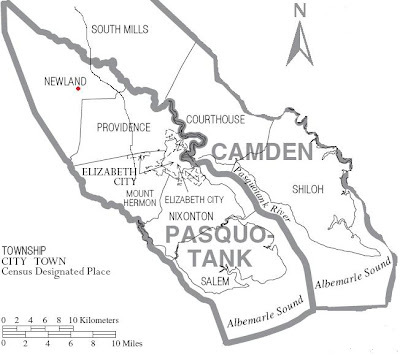 *The little red dot in the ‘Newland’ part of town is where my ancestors lived. The black line is the main road going from Pasquotank to Camden County. Pretty close, huh? The vast majority of my Spence ancestors come from Pasquotank County, NC. I can trace my Spence line to dang near the same road they currently live on today to 1870. But, my [living] family has told me that anyone with the last name of Spence in Camden and Pasquotank County is our cousins. They know this because this is what was told to them by their parents and/or grandparents. Camden and Pasquotank County is close. Close doesn’t even describe how close they are. They lifestyle of the counties seem to overlap. My uncle works with one of the Camden County Spence’s and another relative works with a different Camden County Spence. Somewhere in this closeness is relation. But, I have yet to figure out how they’re related to the Pasquotank Spence’s..my Spences. A recent contact on Facebook has me researching this side again. She is from the Camden County Spence side and she said they go over the family tree every year. I gave her some information and my theory on how the Pasquotank and Camden County Spence’s are related. She think that her 2nd great grand and my 2nd great grand, Aaron are brothers. But her 2nd great grandfather, isn’t old enough [in my opinion] to be his brother. He wasn’t born until 1889. Aaron was born 1853. Somewhere between 1880 & 1900, Aaron’s father passed away and in 1900 his widow, Susan, was living with her son Aaron. My theory is that one or a few of the Camden County Spence’s born prior than 1853 are the siblings of my 2nd great grandfather Aaron Edward Spence. According to the 1900 census, his mother Susan Williams Spence stated she had 6 children and 4 were living. I assumed that Aaron Edward Spence was the youngest child because parents tend to go live with the youngest child. But, I do think that her 3rd great grandfather, Moses Spence and Aaron could possibly be siblings. He was born 1846. Moses married Louisa Turner in 1875. I know I have the marriage certificate around here in my papers. I remember either seeing no parents listed or N/A listed for Moses parents. Which is odd for me. If he is infact Aarons brother, why doesn’t he list his parents when they were alive when he got married?? Then another confusing thing, on the 1880 census for Moses and Louisa (Lewissie), there are 4 children listed. The wierd part is that their last name isn’t Spence and they were all born after the marriage in 1875. The oldest child being 4 born 1876. Not only that, but that child is listed as illegitimate also. The listing of illegitimate would make me think that they’re her children that she had with someone else, but still came home to her husband. WHOA. Now, I know what you’re saying..why are you sharing? This is WAAAAYYYY personal, right? Well, the ancestors made me do it. I was researching Moses, minding my own business and these children distracted me. There’s a reason. I can’t stop thinking about them. Tomorrow, I will be requesting a copy of the marriage record for the oldest child. Previous PostPrevious Ancestors are Talking..do you hear them? Next PostNext VOTE FOR ME!! !